Propagate Skyscraper converts harmful greenhouse gases into usable building materials! It is a self-propagating structure whose growth is dependant only on the weather conditions and the quality of air surrounding it. Carbon dioxide is turned into a solid material that builds upon an existing scaffolding structure. 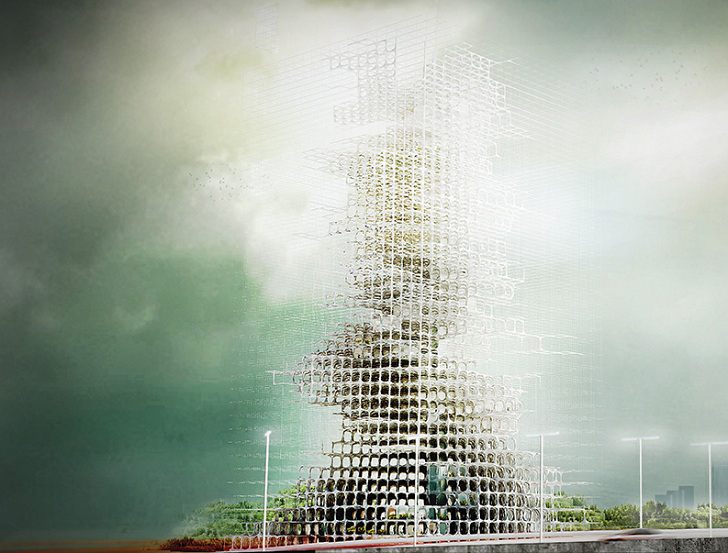 This innovative project won 3rd prize at this year’s eVolo Skyscraper 2014 Competition. Propagate Skyscraper introduces the exciting prospect of converting air pollutants into building material. The approach builds upon existing research on capturing carbon gases through carbon-philic resins and transforming them into solid construction material that can create self-propagating structures. A scaffold facilitates the initiation of the process, while the actual pattern and growth of the structure is defined by environmental factors such as wind, weather and the saturation of carbon dioxide within the immediate atmosphere. The growing structure can extend into six directions and promises a possibility of flexible creation of built environments. 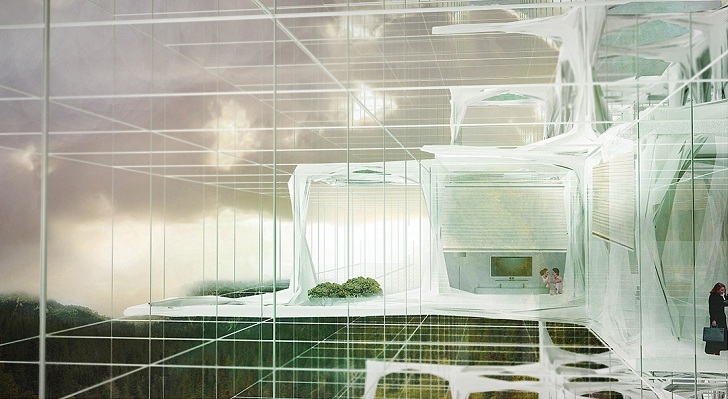 The structure can create clusters of habitation that have the circulation access at the center and can each accommodate additional communication routes. The tetris-like stacking creates myriad of spatial conditions that establish new forms of social interaction. The competition jury included Wiel Arets, principal of Wiel Arets Architects, John Bechmann (Axis Mundi), Michael Hensel (AKNW + NAL), Lisa Iwamoto (IwamotoScott Architecture), Kas Oosterhuis (Oosterhuis-Lénárd), Derek Pirozzi (Architecture + Design), Tom Price, Fernando Romero ( FR-EE), Craig Scott (IwamotoScott Architecture), Carol Willis (director Skyscraper Museum), and Dan Wood (WORK Architecture Company).